These make great gifts, they are wax coated pine cones that work as fire starters in wood stoves and fireplaces. I just saw a gift basket of them at my local Christmas Store and it was on sale for $80 ..so I had to figure out how to make them on my own. Melt wax in a double boiler (do not leave unattended). Add a few drops of essential oil to the wax, if desired. Add candle dye or a few broken crayon pieces to the wax for color, if desired. Dip the first pine cone into the wax using tongs. Coat thoroughly. Hold the cone over the melted wax until it stops dripping. Then, place it on a piece of foil or wax paper to dry. Repeat with the remaining pine cones. Once the wax has hardened, your pine cone fire starters are ready for use. Just stick one in the fireplace with some kindling, and light. To dry freshly gathered pine cones, place them on a cookie sheet; and bake them in a 150 degree oven for one to two hours (watching them closely). Once the pine cones open up, they're done. 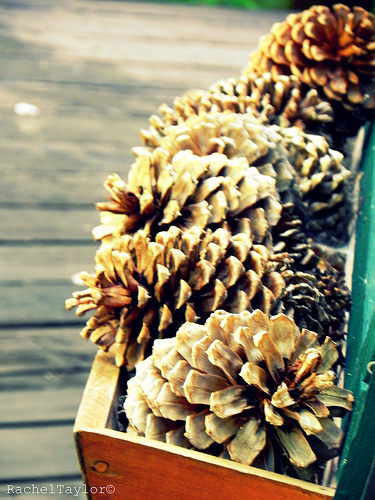 For even more fragrance, sprinkle your favorite spice onto the pine cones before the wax has had a chance to dry. Try cinnamon, thyme or rosemary for a delicious scent that will fill your whole house. Make up several different colors of fire starters, and display them on your fireplace in a big basket. The possibilities are endless as far as gift baskets, so be creative and use with a mix of greens and dried flowers for the festive look.